We represent a quite small particle in the middle of an element This picture(table) reflete the love which I have for the nature and the integration within this derniere. 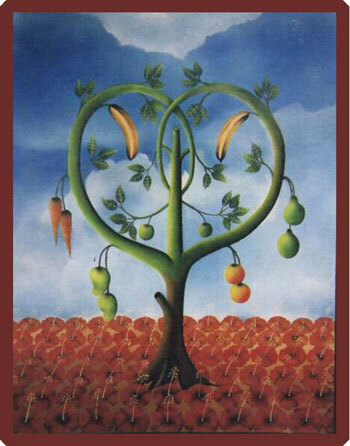 The grouping of fruits by two on the tree, branches of which cross themselves to form a heart, symbolizes the reve of a delirious artist, the life in couple, the harmony in homes(foyers), the perseverance in the love The colour of the tree represents the esperance which I have to see this reve becoming re-confine to bed a day. On a field of hibiscus, symbolizing the victory of the truth on the forgery, this quisqueyenne flower binds(connects) the theory has the practice, the abstract in the concrete. So I invite you all, lovers of the beautiful arts, has you find in this cloth(canvas), which I would have been able to call :the mysthery of the life .